Aviation has always been a part of Amy Helm’s life. And now that she’s added airport manager to her job titles at the Glenwood Municipal Airport (she also works as a plane mechanic at Aircraft Repair, LLC, which operates out of the airport), she’s focused on making sure everyone in the Valley can enjoy that same level of accessibility to her passion. “I’ve been super motivated,” Helm said. Last year, the airport hosted its first Community Aviation Expo. “That was such a huge success, and it was a lot of fun. We gave over 150 airplane rides.” Additionally, she’s been redeveloping the website, complete with webcams, and getting a social media presence going for the airport. When not overseeing the airport’s operations, Helm is either piloting her own plane — a Cessna 175 — or working on one. One of the better-known aircrafts that the crew works on is the area’s Emergency Medical Services helicopter. “They’re based out of Valley View Hospital, but their hangar is here. They fly it back here to refuel or get the maintenance done,” she said. A municipal airport — its runway is too short to accommodate commercial planes — isn’t an obvious community partner, but Helm is working to change that perception. Last year’s Expo was a start. She’s already in the early planning stages for this year’s event, which will likely be in August. And the summer is also skydiving season, which helps bring in tourists. Helm is happy to act as a liaison between visitors and the Valley. “There’s a couple hotels in town that offer pilots discounts. We can direct all our tourists to them. We want people to help us out, but we want to be able to promote all these awesome businesses,” she said. That kind of symbiosis is reflected in the airport operations, as well. Volunteers often work on improvement projects, and the entity partners with complementary businesses to offer the maintenance services, skydiving, scenic tours, charter flights and even training. “We’re based in Eagle, but 100 percent of our maintenance is done in Glenwood Springs,” Alpine Flight President Loren French said. Alpine Flight is one of the aforementioned partners that offers myriad ways to enjoy aviation in the Valley. That means French gets to interact with people of all experience levels, he said. 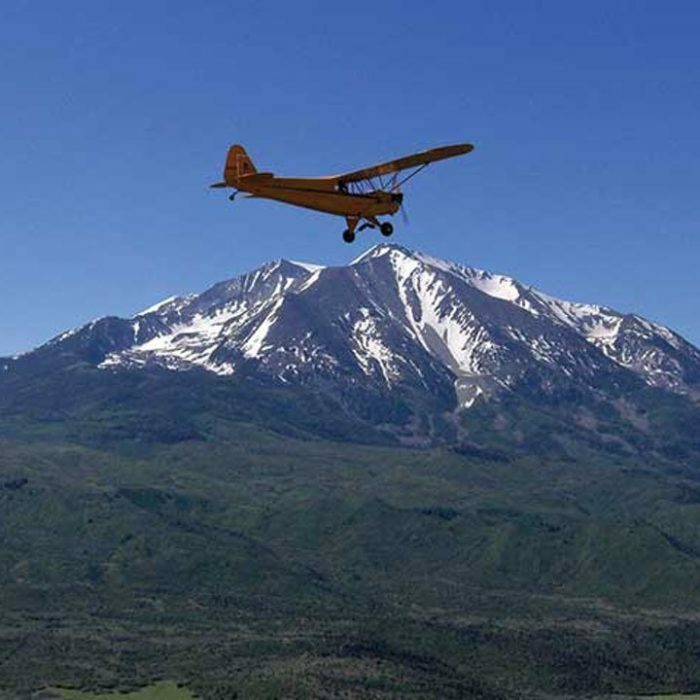 In the flight school, he sees first timers and experienced pilots alike, the latter of which often need to fine tune their skills to safely accommodate mountainous terrain. Partnering with a flight school is particularly near to Helm’s heart, as she hopes to one day partner with local high schools to create work-study programs — after all, she got her piloting license while still a student. For Helm, aviation is personal. “My dad is a private pilot,” the Carbondale native said. “We would go flying Saturday mornings — just hop in the plane, visit family. I fell in love with aviation at a young age.” That love later sparked her career, which includes a four-year stint flying in Alaska’s backcountry before returning home. “My whole family still lives in Carbondale and [I] kind of missed the sunshine,” she said. French, too, has fond memories of the municipal airport. “I learned to fly up here between the Glenwood and Eagle airports. I did those lessons 22 years ago in 1996. Even as I was learning as a brand new student pilot, I was flying in and out of Glenwood,” he said. Helm wants to ensure that the airport’s future is as rich as its history and that more people get those aerial perspectives. “I want to focus more on community events here at the airport. Let people know that we’re here, and we want to teach you to fly; teach you to work on a plane; have you come out and go for a ride,” she said.